Participants from Big Brothers Big Sisters of Victoria were joined by Pacific Fleet Club Executive committee members and HMCS Victoria and HMCS Chicoutimi crew members. Six “littles”, as they are affectionately known, from Big Brothers Big Sisters of Victoria were accompanied by four adult mentors and family members on an unusual sightseeing tour last week. 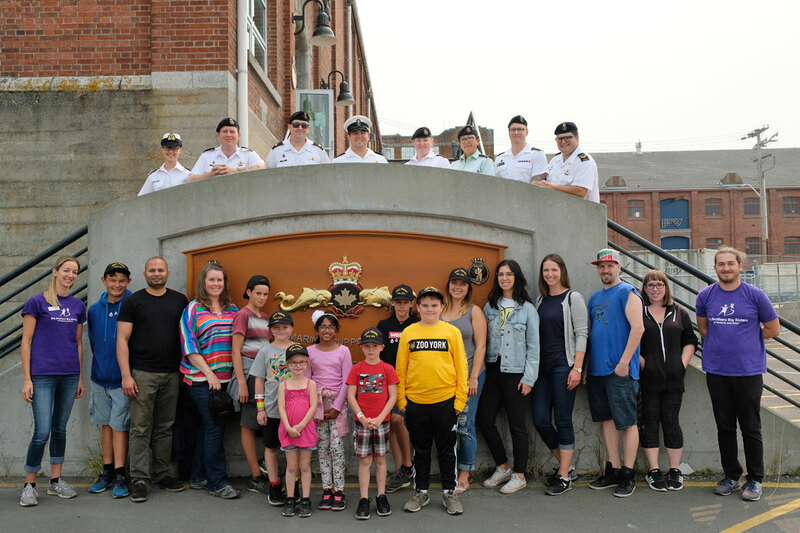 The youth had the rare opportunity to venture down into the submarine HMCS Chicoutimi and walk the decks of Halifax-class frigate HMCS Regina. The Saturday tour was at the suggestion of PO2 Devin Maxwell, a naval communicator in Chicoutimi. One by one the group crossed the brow onto the black hull and then traversed down the hatch via ladder into the submarine. Once inside, submariners showed them the inner workings of the Victoria-class diesel boat, something very few members of the public get to see. Awaiting the youth on the jetty as they climbed out of the hatch at the tour’s end was a police cruiser and fire truck brought over by the Military Police and Esquimalt Fire Services. It was a hands-on moment as the youth donned fire gear, climbed the fire truck and let the police cruiser siren bellow. In the afternoon, the group moved to Regina for a tour of the surface ship. “Half the kids wanted to become submariners and the other half wanted to be surface sailors,” said PO2 Maxwell. At the end of the day, the sailors surprised the group with a $1,600 donation from the Pacific Fleet Club executive committee and the Submarine Forces. PO2 Maxwell deemed the event a success.